Chemistry education today involves a high level of collaboration among undergraduates, graduate students and faculty members and research that uses sophisticated equipment to take precise measurements. 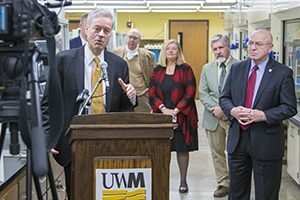 The UWM Chemistry building’s separation of classrooms from labs makes it difficult for students to interact and see the integration of teaching with experimentation, said Joe Aldstadt, the chair of the UWM Department of Chemistry and Biochemistry. Setting up instrumentation and equipment to accommodate laboratory experiments is hampered by the restrictions in available lab space for experimental setups. For the full story see the UWM report.